Tensions are escalating in southern Yemen between the leaders of the southern resistance forces and the Southern Interim Council, on the one hand, and the government of Prime Minister Ahmed Obeid bin Daghr who represents the internationally recognised Yemeni government in its temporary capital of Aden. 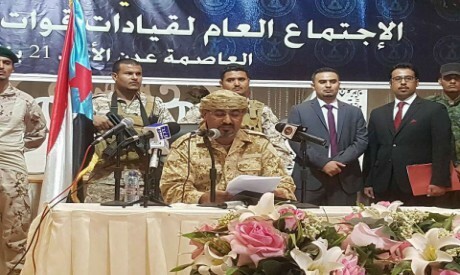 The leadership of the southern resistance forces, an unofficial army formed during the Houthi incursion into the south in 2015, threatened to form a parallel “war government” if Yemeni President Abd Rabbu Mansour Hadi, who currently resides in Riyadh, does not dismiss the Bin Daghr government, which has been described as “corrupt” and responsible for the deterioration in standards of living in the south. Aidarus Al-Zoubaidi, commander of the southern resistance forces and former mayor of Aden, declared a state of emergency in the southern capital and announced the beginning of measures to oust the government and replace it by a government of patriotic technocrats. The leaders of the southern resistance forces released an official statement expressing their opposition to any non-southern military presence in the south, whether northern forces affiliated with the legitimate government supported by the Arab coalition or others (referring to the Houthi and the General People’s Congress forces). It appears, in light of the foregoing, that the southern resistance forces are in the process of transforming into a standing southern army and that this army rejects the presence, in the south, of the official army even if it supports the officially recognised government politically. Even then, it supports President Hadi as the chief representative of the legitimate authority, but no one else. Hadi represents the international consensus. As for the others, they represent the Muslim Brotherhood. This applies, above all, to Mohsen Al-Ahmar, a prominent military official in the Hadi government who is known to be close to the Islah. There are clear signs that the UAE supports this outlook. If so, it means that the meeting brokered by Saudi Crown Prince Mohamed bin Salman between Emirati Crown Prince Mohamed bin Zayed and Muslim Brotherhood Secretary General Mohamed Al-Yadoumi several weeks ago failed. It also indicates that the southerners refuse to allow Aden to serve as the interim capital for northern decision-makers and that they insist on having the primary and ultimate say there. This puts President Hadi in a spot. Either he will have to dismiss the Bin Daghr government or he will have to relocate it at a time when the government is taking measures to remain in the south until the war against the Houthis in the north ends and Sanaa is retaken from Houthi control. Yemeni political analyst Abdel Hakim Al-Mayouni told Al-Ahram Weekly by phone from Aden that current disputes between leadership figures in the south may put paid to the southerners bid which, he said, only serves the interests of certain parties as opposed the higher national demand. He added that there were confirmations that the declared southern position had been prepared in advance and put to southern leaders without consultations, which angered many and led them to lash out against it. Some Yemeni sources have been struck by the fact that, as preparations are under way to convene the parliament, which is made up of pro-Hadi government representatives, Tarek Mohamed Saleh, the nephew of former president Ali Abdullah Saleh, arrived in Aden. Saleh, who had managed to escape during the assassination operation against the former president, is assembling the core of a military force consisting of southerners who supported the Saleh faction in the General People’s Congress (GPC). This, too, has sparked tensions with southern forces who reject northern intervention in the south. “Things are growing extremely complex, especially in areas that involve the relations between the UAE and Saudi Arabia,” observed the Yemeni journalist Hossam Radman in a telephone interview from Aden. “The southern resistance forces are receiving Emirati support. But will Riyadh agree to push for the dismissal of the current government and the creation of an alternative that meets the southerners’ specifications? Or will the situation spiral into military clashes?” He noted, in this regard, that Aidarus Al-Zoubaidi is manoeuvring to impose new rules of engagement in the south, in spite of many obstacles. Ould Cheikh’s decision is another reflection of the current state of affairs in Yemen: the stalled negotiating process and the complexities of kick-starting it again, the military escalation with no prospects of a political or a military solution in sight and, as he noted, the worsening humanitarian tragedy. Concerning the humanitarian crisis, the Arab coalition announced that it had launched a comprehensive humanitarian operation, donating $1.5 billion to cover a number of initiatives. The coalition, following a meeting of coalition of foreign ministers in Riyadh in the middle of last week, announced that Al-Khadra Border Crossing would be opened to facilitate the arrival of aid to Yemen and that commercial ships would be allowed entry into ports to deliver supplies, including fuel. The coalition also stated that the port capacities in Yemen had been increased in order to receive the aid. Coalition Spokesman Colonel Turki Al-Malki said that the blockade on the port of Al-Hodeida would be lifted for 30 additional days to facilitate the arrival of aid and that 17 security corridors leading from six locations would be used to deliver the aid to Yemen. He simultaneously stressed the coalition’s full commitment to protecting relief workers.